Born Again originally aired in 2005. Davies revived Doctor Who devoted considerable time to reintroducing the core concepts of the series. 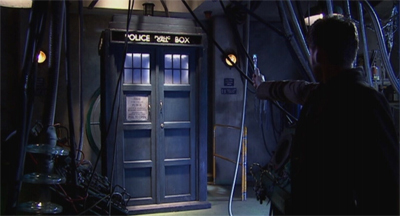 Unlike The TV Movie, Davies saw no need to over-complicate Rose by featuring the regeneration from the previous Doctor to the current lead. The Ninth Doctor was introduced as-is to an entire generation of new viewers. Only a quick examination of his features in Rose seemed to hint that he was getting used to his new face. The prospect of “regeneration” hadn’t been flagged too heavily by the time The Parting of the Ways aired. This makes sense. For one thing, there’s a sense that Eccleston’s departure was not something that the production team had accounted for – which makes it even stranger that the whole first season seems to be building towards his redemption in death. For another thing, it’s very hard to drop “by the way, I change into somebody else when I die” casually into conversation. So the regeneration at the end of The Parting of the Ways was kind of a big deal, and a huge moment for the series. After all, the classic Doctor Who had enjoyed more than three seasons with its lead character before having to swap him out – Hartnell being the last member of the original ensemble to depart. And, given the rules of television narratives in 2005, there was no way that the show’s first regeneration wasn’t going to be a pretty significant event. The Last of the Time Lords originally aired in 2007. I just need you to listen. No, it’s my turn. Revenge! I like quite a lot of The Last of the Time Lords. I think, for example, that Russell T. Davies does an exceptional job creating a version of the Master that manages to remain true to the character’s pantomime roots, while also seeming a credible threat and dark mirror to the Doctor. I also think that Martha’s character arc has a fairly logic and fluid conclusion. On the other hand, there’s a great deal about the resolution to The Last of the Time Lords that feels a bit rushed, a bit convenient, a bit tidy. I’m quite fond of Davies’ writing style, but I’ll concede that he tends to favour theme and character over plot and structure. The Last of the Time Lords does an excellent job illustrating this, providing a bunch of fascinating thematic and character-based moments, but positioning them in a plot that doesn’t really work. Dalek originally aired in 2005. I’m sorry. I’m so sorry! I swear, I just wanted you to talk! Then hear me talk now. Exterminate! Exterminate! Exterminate! Dalek is a pretty effective reintroduction of the show’s most iconic villain. It’s also something of a tour de force for lead actor Christopher Eccleston and Dalek vocal performer Nicholas Briggs. It’s full of interesting ideas, and perhaps the biggest swipe the show would make at “superfans” this side of Love & Monsters. That said, Rob Shearman’s script is occasionally a bit clumsy in its execution, never quite managing to convince the audience that the Doctor might be turning into a Dalek, no matter how firmly it labours to point. Still, minor quibble aside, it’s a wonderful way of welcoming the Daleks back to the fold. Victory of the Daleks originally aired in 2010. Would! you! care! for! some! TEA???!!! Ah, the Daleks. They tend to rise and fall. They get built up and then they fall back down. Like the show itself, they come and go in cycles. The Dalek Invasion of Earth has the psychotic pepperpots invade Earth, while The Chase reduces them to little more than comic foils. Destiny of the Daleks makes jokes about them being unable to climb stairs, while Remembrance of the Daleks then proves that they can. In 2005, both Dalek and The Parting of the Ways invested considerable effort in making them scary again. The show eroded that away over time, turning them into bitchy foils for the Cybermen in Doomsday for the Doctor to hover up and competing to create the most phallic monster ever in Evolution of the Daleks. Steven Moffat took over the show in 2010, and that means that he also took over the Daleks. Tending to the Doctor also means tending to his worst enemies. And, to be fair, that’s a bit what Victory of the Daleks feels like. It feels like an obligation, a bit of business to get out of the way quickly (the first episode not penned by Moffat) so that the fun stuff can commence. Utopia originally aired in 2007. Ooo, new voice. Hello, hello. Hello. Anyway, why don’t we stop and have a nice little chat while I tell you all my plans and you can work out a way to stop me, I don’t think. Hold on. I know that voice. I’m asking you really properly. Just stop. Just think! It’s very hard to talk about Utopia without seguing into talking about The Sound of Drums or The Last of the Time Lords. Certainly the third season finalé is the most ambitious of Russell T. Davies’ end-of-season adventures. It’s a three-part adventure, the equivalent to one of those classic gigantic six-part serials. If you accept that logic, it breaks down neatly into the old two-parter-and-four-parter format that the writers used to use to prevent an extended story from dragging too much. 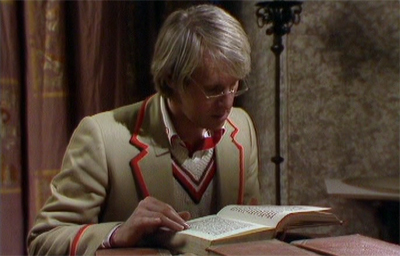 Utopia, of course, serves the function of the two-parter in this classic structure – the smaller chunk of the episode with its own plot points and characters and settings, but with very definite connections to the rest of the adventure. However, I’d argue that Utopia is a lot more successful than either of the two episodes following, and a lot of that stems from the fact that it devotes a considerable amount of time to quietly setting up plot points and characters that will pay off down the line. It’s also a powerful subversion of the fundamental ethos of Doctor Who, which makes it particularly effective as we head into two episodes where the Master hijacks not only the TARDIS but the show itself.